Total Price is $1,100 shipped standard ground to the lower 48. Please email me before ordering outside of the lower 48... I'll collect final balance when we ship. This system allows you to tilt the clam of an Elise in under 5 minutes. It requires drilling 4 holes in the boot of your clam, but otherwise nothing that can't be reversed. It will save a couple pounds of weight on a net basis. It is set up for a PC625 battery, although I'm sure a crafty person can/will make soemthing else work. It has been done on an Exige but takes some additional creativity. Last edited by turbophil; 11-12-2008 at 06:20 PM. Hey, I've been in that garage before! Good job with the tilting clam, I'm sure LordZ appreciated it during his VF install. What needs to be done on the exige for it to work? The Captain: I successfully installed Phil's tilting clam to my 2006 Elise this past weekend. This is a most excellent addition and worth every penny. Lordz: The kit is worth the money if you are looking at messing around with the motor in the future, adding a SC, changing clutches, pulling the motor, changing headers, etc. Makes working on it 100X easier. Jim-clayton: The tilt install is done. What a marvelous product. A must have for anyone who works on their own car. Tilt the clam and you get easy access to everything, headers, belt, airbox, etc. Phil, you made a bracket to relocate the battery in front of the engine. Does this kit include that, or is the battery still in the boot? Is that extra work for installation, or just for the lift after installation? What all different has to be done during installation? How long did it take you? So no more interior latch to release the trunk? What are you using to keep it closed the AeroCatch system? If so how do you have it mounted? I can't figure out where to put the anchor. I think Z means that he disconnects the latch cable prior to tilting. He still uses the latch cable for everyday use... There's no doubt that on the Elise, this is a very quick operation. I have opened mine no less than 500 times with all the work and crazy ideas I tinker with on the car. 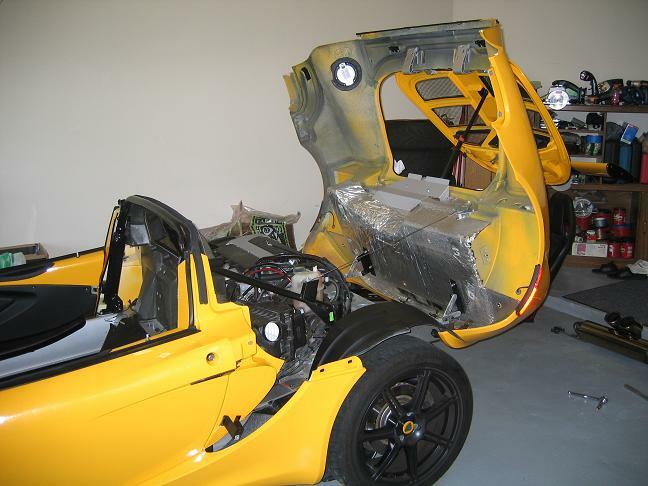 From Z describes to me, the extra bits on the Exige just have to come off prior to tilting and that adds about 15 minutes to the job to make it a total of a 20 minute ordeal... Which still makes sense, I think, as it's 2+ hour ordeal to pull the clam without this mod. Got it to work now. For some reason it wouldn't let me. I restarted my computer and started the process over and it worked fine. Thanks Phil. Looking forward to it. It's ok, there's something in the mail for you to make up for it. Just lift, nothing different for installation. 1.5hrs for me to take clam off first time, honestly took me longer to put the interior back together with the factory roll bar than anything else. I took my time and did it over a weekend. Can be done in one night probably though. For the Exige, make sure you have some sort of a bench or adjustable stands to put the clam on. It's very heavy and doesn't sit well on the ground. The bottom of the rear wheel arches flex alot if you just sit it on the ground. I just reattach the cable each time. I took the metal shield off from in front of the release to speed this up. Don't have to, but it's just a clean up piece anyway to hide the release catch. Takes about a min or two to get it undone. Taking the side scoops off takes more time due to those damn hex screws that seem to want to strip each time. I could probably get it down to 10mins if I rushed it, but then I'd have to put my beer down and use both hands. waiting for the bucks to transfer from bank to paypal.